The human brain is still mysterious to scientists in spite of all the attempts and experiments to understand it. 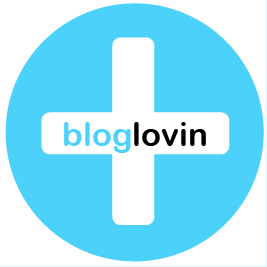 Now there has appeared the technology that allows scientists advance their knowledge and understanding of the organ. It is the ground of the new exhibit at Franklin Institute in Philadelphia called Your Brain. The bright interactive exhibition represents a network model of two storeys with sounds and lights that are set in motion by footsteps. Various interactive devices help to understand the way our mind works better. 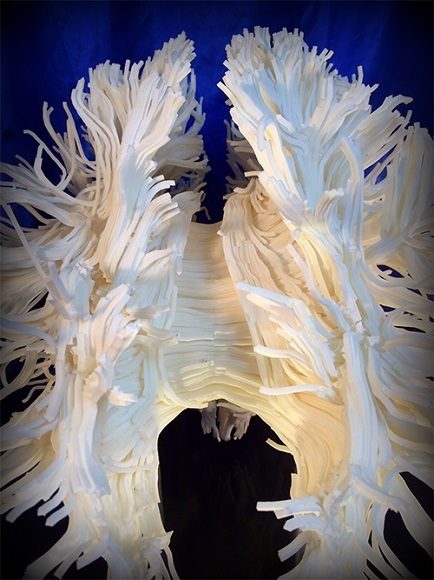 The major attention of the exhibition is the tangled 3D printed replica of the white matter of our brain. 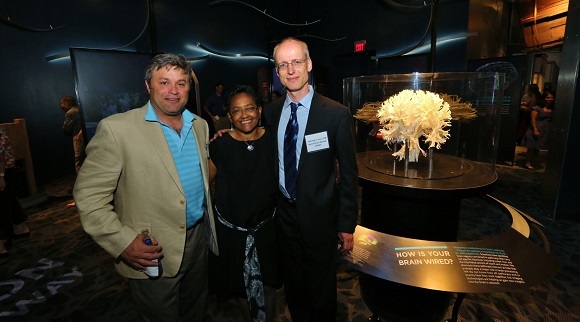 Dr. Jayatri Das, Chief Bioscientist at Franklin Institute, who is the lead developer of the exhibition, contrived the demonstration as part of the new building of the institute. The main principles of their exhibits are to make real science clearer and more accessible by applying practical interactive exhibits. From the point of view of education this concept with functional pathways is important for studying brain, that’s what is reflected in the exhibition. The exhibit is what helps scientists understand the complicated wiring of those pathways. The 2D images they had seen were excellent, so they decided that such a spectacular and intriguing sculpture could become both a way to research and a genuine design focus. One of the researchers of the museum Dr Voss, Associate Professor of Physics in Radiology at Weill Cornell Medical College, spent about a decade researching the intricate brain neuron mapping, doing numerous MRI scanning to get better 3D tractograms of brain matter. It’s common knowledge that our brain consists of grey and white matter. The white matter consists of fibers which connect areas of grey matter among one another. An MRI scan of a 40-year-old man showed diffusion tenors, they managed to create white matter fiber areas from them. The 3D data file was large and composite. And because of its size it’s quite difficult to view and 3D print it. Dr Das and his team have spent long time planning to get this 3D model printed. As soon as they got the data they got manifold 3D printing providers but had to turn them down. Other researchers told them that the model was too difficult to handle on the 3D printer. But they knew that 3D printing was appropriate to deal with composite shapes. 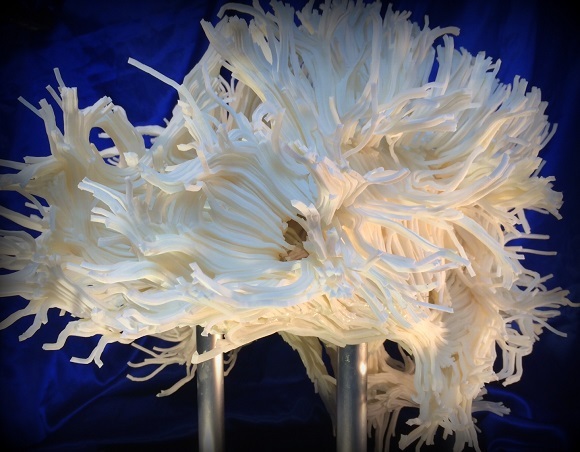 Each part of the white matter was called a “thread” and all together there were 2000 threads in the file. However the seeming beauty achieved by the composite threads caused the model to be turned down. Finally they came across the team from Direct Dimensions headed by Michael Raphael, who have been dealing with 3D scanning, capturing and digitization for about 20 years and have become experienced in all the types of 3D equipment. It was enough for their Art Director, Harry Abramson, to take one look at the model and he immediately got the idea of how to complete it. The only question was whether the budget could afford that. Harry Abramson talked to his partner from American Precision Printing (APP), a 3D printing service bureau located in Tulsa, OK, Jason Dickman, and together they decided that for such a fragile and complex design the only possible choice was SLS from 3D Systems. They went over the size limits of the build cover, its volume and soon they came up with the price. They also guaranteed they could create the brain provided that Harry and his team could prepare the files. They managed to make up the lacks in the budget with the long lead time and so the project started. Dr Voss had some amazing data with which they started. To print this huge construction all the models had to be fused to make up one whole brain model, which was then to be cut into parts to fit the build cover. The model needed then design and engineering modifications for its better support on the custom frame. Eventually it took them several weeks to prepare the file for APP. The work had to be done by an extremely skillful technician with the right disposition. The project would have never been completed but for the right human resources. There was also a huge task to sort through 2000 strands. The SLS technology by 3D Systems uses strata of plastic powder fused into a 3D definition by mighty CO2 lasers. The materials are firm enough for aerospace and self-propelled uses, which was most suitable for the project. The Direct Dimensions team had to cut the 3D data into parts that were to be printed within the restrictions of the SLS systems. When the re-arranged data was received from Direct Dimensions the team continued creating parts of the model that could be printed on the sProHD 60 SLS equipment at the Tulsa facility. The biggest challenge was that the length of the model was 26 inches, whereas the SLS machines are restricted to the size of only 18 inches. So they had to build, map and to bring together 10 separate pieces into a single part. It took the team at APP about 22 hours to complete each build. 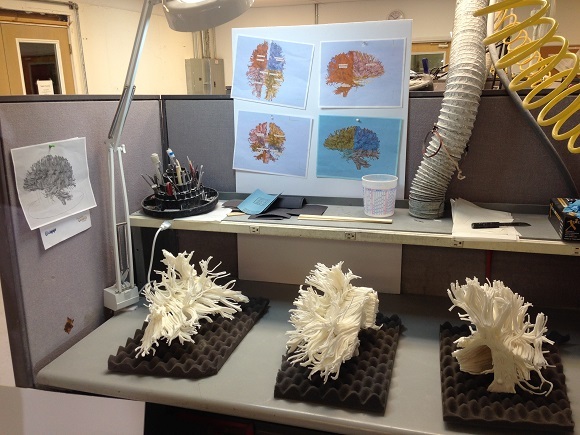 When they came from the printer, the team started mapping and assembling the separate pieces into the ready model. In spite of all the re-arrangements of the data, there were some strands that needed assembling. All that was a big amount of work for all the teams. But from the very beginning it was clear that it would be marvelous. 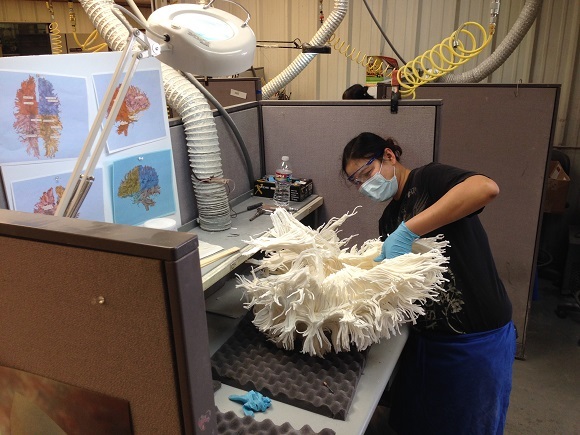 This large brain is a good example of all the might of 3D printing. The beauty and excellence of the brain will take away your breath. If it’s difficult for you to understand what it presents, it will at least awaken a feeling of wonder about our brain. The brain is a result of great work of a team of people. 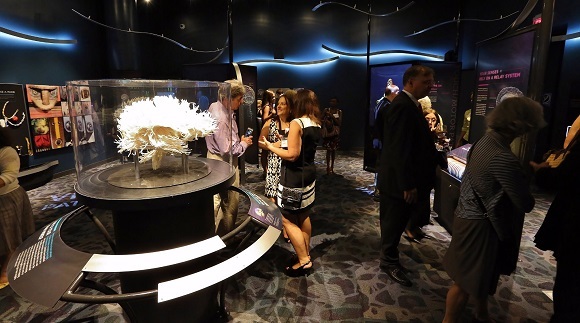 Visitors of Franklin Institute can enjoy Your Brain as the major exhibition of the museum. Are Researchers Ready to Create 3D Printed Organs by Next Year?